Happy Groundhog Day! If I get 6 more weeks of the 70 degree weather we had today, I'll take it! I'd love to share the cute little craftivity my kiddos did for Groundhog Day but I was busy trying to come up with outfits for the Vocabulary Parade. 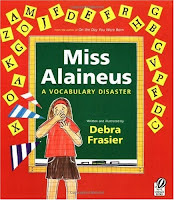 This parade is based on the book Miss Alaineus: A Vocabuary Disaster by Debra Frasier. Our kiddos are supposed to create costumes depicting a vocabulary word and parade around the school. I'll let the answers to these questions serve as your 12 fun facts! 1. What do you do on your summer vacation? I get teach my incoming kiddos! 2. What is your favourite restaurant? Any Thai restaurant...or Chick Fil A! 3. What would your job be if you were not a teacher? I've never thought of anything else, but I suppose I'd be a child psychologist. 4. What is the worst part of being a teacher? I do not love the endless amount of unnecessary paperwork. 7. Where is your favourite place to shop? This girl loves Loft! 8. What do you drive? I drive a Ford Mustang...not my first choice but I had it in college and I don't have a car payment! 9. Who is your Hollywood crush? Oh boy, do I love Justin Timberlake! 10. If you could be anywhere in the world right now, where would you be? I would love to be sailing on a Mediterranean cruise. 11. What is one of your favorite books? The Last Lecture by Randy Pausch...so touching and inspirational. 12.﻿ What is your favourite movie? I have always loved Matilda...I wanted to grow up and become Miss Honey. I'm pretty sure every blog on the block has been tagged already! Wow! 3 days notice? What is a vocabulary parade? I've not heard of this. I hadn't either! The idea comes from the book Miss Alaineus: A Vocabulary Disaster. The kiddos are supposed to make costumes illustrating a vocabulary word and we parade around the school for parents and other spectators. Can you pick just one word and have each student illustrate it for their own meaning? I love the idea of a vocabulary parade. I am putting together a training on vocabulary right now. I would love to see pictures or hear more about this. I'm a big fan of the loft too. We have an outlet near by and I'm already planning my spring and summer wardrobe. I'm going on my honeymoon in June and I need some cute clothes.